The closure of a barrack in York would "harm the local economy" with the loss of up to 1,400 jobs, an MP has said. 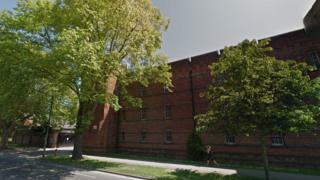 Imphal Barracks is due to shut in 2031 as part of the government's plans to sell off more than 50 UK defence sites. MP for York Central Rachael Maskell has launched a petition in a bid to save it from closing. The Ministry of Defence (MoD) said it would "consider the best possible future use for the site to maximise local economic development". "It's going to have a massive impact in York," she said. Imphal Barracks has 728 serving personnel, 376 civilian staff, 100 contractors and "more in the wider supply chain", said Ms Maskell. "The MoD promised just 18 months ago that the barracks were here in York to stay and they put loads of investments, spent loads of money in upgrading the barracks in order to bring in the first division so I think there is a case to be made. "I want people across the city to join in a big community campaign." She claims there was "no economic and social impact assessment undertaken". "To put forward a proposal without any evidence whatsoever, not even participating and carrying out an obligatory economic and social assessment, which the MoD has to do before it makes these announcements is quite astounding." In a statement, the MoD said: "We are committed to creating a defence estate that effectively supports modern military capability and is working to reduce the size of its estate by 30% by 2040. "As part of this we are releasing sites which are surplus to Defence requirements, including Imphal Barracks." The government announced its plans in November, saying it would raise money for "better training facilities" for troops and provide land for housing. Strensall Barracks, near York, and parts of Catterick Garrison, in North Yorkshire, are also scheduled to close under the proposals.